Freshmen Ryan Shields, Blake Weingart, and Hunter Hayden fix hoses for the pigs' water feeder in AG class. As Big Sky students begin to prepare for the 2019 – 2020 school year there’s one thing they have in common — deciding which classes to take. This can be a difficult decision for some students, often they’ll wonder which classes will be best for them and will prepare them for their life after high school. The Sun Journal surveyed juniors and seniors at Big Sky to try to help students answer some of these questions. Among the most suggested classes are Culinary, Personal Finance, Weight Training, and Art and Music classes. We broke down some of the most popular classes suggested by upperclassmen. A yearlong class available to juniors and seniors, the psychology class provides a Social Studies credit and a look into the workings of the human brain. “It’s a very interesting class. You learn a lot about cognitive and biological psychology.” Says Junior Jasmine Bautista. 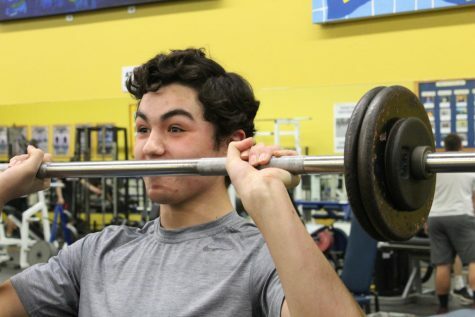 “Weight Lifting has helped me to learn about challenging myself and learning my limits.” Says Senior Kyle Parker. There are two choices for a weight training class; beginning and advanced. Both are semester long, elective classes open to any student. You can choose which to take depending on your personal ability and preference. In this class you have the opportunity to build on your strength and achieve your athletic goals. For this course there are three levels. Culinary 1 is accessible to all, 9th through 12th grade. You can take Culinary 2 sophomore, junior or senior year, after you’ve taken Culinary 1. For Culinary 3 you have to be in 11th or 12th grade and must have taken Culinary 2. Each of these are semester long classes, giving you 0.5 Career and Technical Ed. credits. “It’s very hands on and doesn’t move to fast.” Says Junior David Colby. 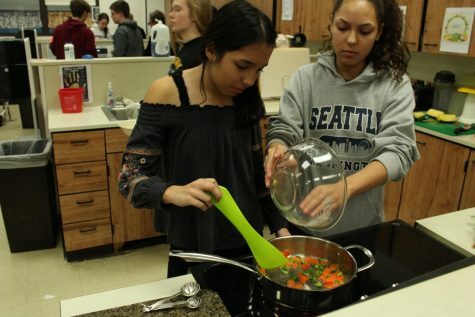 Taking Culinary provides an important life skill, the ability to cook for yourself, and is applicable to everyday life. Theory of Knowledge shows students a different way of thinking that can help them to have a better understanding of the world around them. This class is two semesters, spring of 11th grade and fall of 12th. It provides an elective credit. “It has taught me more about life and how to think about everything than any other class, and is applicable to every other class.” Senior Katie Rolle says. “You learn a lot of interesting information and it gives you a look at street culture.” Says Junior Hannah Kolar. This semester long class is for sophomores, juniors and seniors and is a great opportunity to build on your knowledge of practical law and gain a Career and Technical Ed credit. There are eight different art classes offered at Big Sky, choosing which is for you depends on the type of art you would like to create. In order to take any other art classes you first have to take Intro to Art, a yearlong class offered to all students, for which you get a Fine Arts credit. After taking this class you can take Drawing, Painting, Ceramics and Printmaking. All of which are a semester long and offer a Fine Arts credit. These are open to sophomores, juniors and seniors who have taken Intro to Art. If you enjoyed Ceramics you can then take Ceramics 2, a semester long class offered to sophomores, juniors and seniors who’ve completed Intro to Art and Ceramics. Also available are IB Visual Art, a yearlong class for juniors and seniors who took Intro to Art, and Senior Studio, open to all juniors and seniors. Any of these classes is a great way for students to express themselves and improve on their skills. “Personal Finance teaches you good money management skills and how to invest in things.” Says Junior Jackson Amaya. Personal Finance is offered to all grades, and is a semester long class that teaches many important life skills, such as budgeting and saving. It is extremely relevant to life after high school and is certainly helpful when it comes to understanding money and financing. Personal Finance is 0.5 Career and Technical Ed credits. “It is nice to get out of the traditional school setting.” Says Senior Kylee Billingsley. In the AG Ed program at Big Sky there are eight courses offered. First, students interested in the AG program need to take Intro to Animal and Plant Science, a yearlong Career and Technical Ed class offered to freshman through seniors. After completing this class sophomores, juniors and seniors have their choice of where they would like to go next. Amongst the AG Ed 2 classes there are Forest and Land Management, Horses and Companion Animals, Plant Science and Greenhouse Management, and Applied Vet Science. All of which are yearlong classes for a Career and Technical Ed credit. AG Ed 3: Vet Assistant Certification is open to any junior or senior who took AG Ed 2: Applied Vet Science. This class is a yearlong class that gives you a Career and Technical Ed credit. The last AG Ed class, Agriculture 3 / 4, is available to any junior or senior who has completed a AG Ed 2 class. It too is a yearlong Career and Technical Ed credit. There are two years of IB History available, year 1 History of the Americas and year 2 20th Century World History. Both are yearlong Social Studies credits. Year 1 can be taken as a junior and year 2 can be taken as a senior and after completion of year 1. This yearlong course is based on instructing students in robotics and electronics. Students learn about electronics through the use of “breadboard” kits and creating electronic soldering projects. Once the basics of electronics are learned, we move into creating robotic arms, sophisticated VEX robots, and making “smart” robots. The culminating project will be a robot competition pitting two robots against two opposing robots.